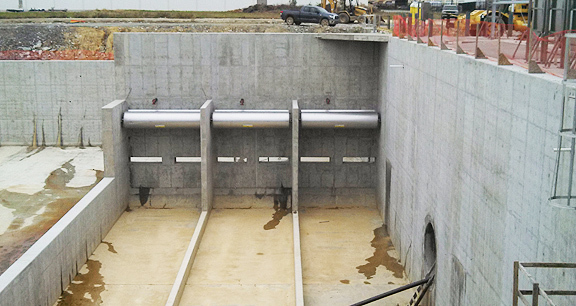 Project obstacles and solutions: The Buechel Basin is a part of the Metropolitan Sewer District of Louisville's master plan to eliminate wastewater overflows during heavy rains. The 40 acre Buechel Basin project includes three cells - two earthen cells and one concrete cell - that can hold over 104 million gallons of diluted sewage. Judy Construction was awarded the contract for the overflow facility. As you would expect, the site was chosen because of its low elevation. But this also meant that the water table was high. Water was continually pumped from the site from the point it was excavated until it was ready for operation. A rain event of any size meant that construction came to a halt until the water could be pumped out of the site. Judy Construction needed a way to make the concrete pouring and finishing process happen quickly. The original plan called for the walls to be produced with three concrete pours - or lifts. Judy reconfigured the forms for a thicker mid-section and was able to pour the walls in one pour with a block out at the top of walls. To resist uplift, they used 1,001 rock anchors. They also decided to use a 40' aluminum shoot instead of crane and bucket to get lean concrete from truck to the backfill location. This helped speed up the pours and keep the crews moving when conditions were right. IMI supplied 18,000 yards of ready mix concrete for the project. IMI also provided lean concrete as backfill for the walls. Another obstacle with this project happened with the reinforcing steel in the walls and corners. Engineering specifications had the rebar tied very closely together. This can cause gaps as the concrete is poured, especially if the coarse aggregates in the concrete cannot get between the steel. IMI QC/QA worked with Judy to come up with a different mix that used a smaller coarse aggregate, but also met engineering specs to eliminate this problem. The Buechel Basin is scheduled to go into operation January 1, 2014.